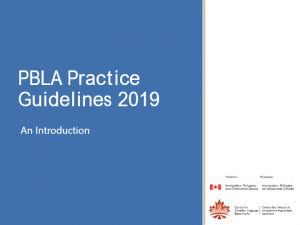 This PBLA learning portfolio is used to document growth and achievement over time and to demonstrate proficiency in terms of the CLB. The assessment practices evident in the portfolio reflect principles of assessment for learning and CLB standards. 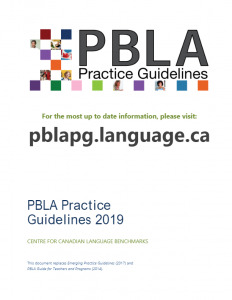 Learner portfolios are housed in the Language Companion – a binder supplied by the funder and given to learners to support language learning, PBLA, and the learner’s settlement in Canada. Three versions of the Language Companion exist: ESL Literacy, CLB 1-4, and CLB 5-8 (CIC, nd). About Me: This section of the portfolio includes needs assessment results, a goal statement and the learner’s incoming CLB levels. Listening/Speaking/Reading/Writing: These four sections of the portfolio hold the artefacts that have been collected since the last benchmarks were assigned. Each skill must include a skills inventory sheet. Other: This section may include a range of information based on the learner’s needs. For example, learners can use this section for artefacts that track progress towards a personal goal, such as getting a driver’s licence, or towards addressing a troublesome, discrete language skill, such as spelling. Learners in specialized classes can use this section for items related to goals in their course or program. In the My Notes section of the Language Companion, learners can file their daily work such as class notes, skill-building activities (e.g., grammar or vocabulary exercises), rough drafts and other program/classroom handouts. For tips and strategies for using the Language Companion, see the supplementary document, Teaching Tips and Strategies . presentation if you have not already done so.